Local actors took part in a workshop to prepare them for performing. Updated: March 27, 2019, 9:43 a.m.
Their experiences are as varied as the roles and emotions they portray. Few can completely understand the theater world without otherwise taking part in a play or performance. Bulloch County is fortunate to offer that opportunity to any that would partake, whether that’s taking a bow in downtown Statesboro or on the campus of Georgia Southern University as students. Discovering Bulloch caught up with a handful of thespians who gladly offered a few words about auditions and callbacks and the thrill of taking the stage. Georgia Southern sophomore from Tyrone, Georgia, Joey Hukin, who recently starred in Emilie, said that acting makes her feel empowered and humbled. “Taking part in an art form that is so vast and ever-changing is incredible. It’s the very embodiment of fleeting beauty, except our beauty is the kind that can change you. But, she said the simple reason she acts is because it makes her happy! Hukin plans to pursue acting as a career, with an end goal of opening a K-12 fine arts school in a low socioeconomic area that doesn’t have access to the arts. Amy Jo Riggs-Deckard, Associate Professor of Nutrition and Food Science at GS, acted in plays as a child and has a musical background, but hadn’t been involved in theater for several years. 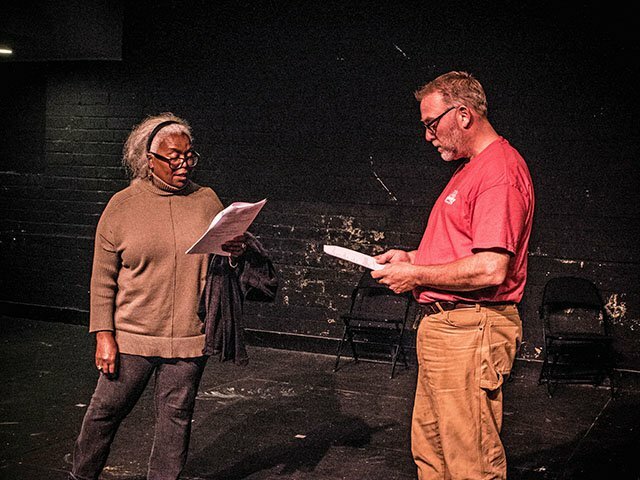 Her then seven-year-old son, Xavier, expressed an interest in auditioning after taking part in a summer acting camp at the Averitt Center for the Arts in downtown Statesboro. Riggs-Deckard said she thought it would be a great way to spend quality time with her son for the two of them to audition together for Oliver. Both were cast for parts and have since acted in several productions including later shows with daughter Olyana, now eight years old. It’s a family affair for the three, though Xavier, 12 now, is more involved than his sister because her competitive gymnastics events take up much of her time. Riggs-Deckard said her husband wants no part of being on-stage, however, he often helps with set-up or take-down. Not all thespians feel the call of the stage at a young age. Seventy-five-year-old John Parcels’ acting career began five years ago and he’s managed to squeeze in twenty plays since that time. Former English and Philosophy professor at GS, Parcels said he’s always been the type of person who wants to help others. So when someone asked if he could help fill a role that had been vacated, his first inclination was to say “yes” because he knew the director was in a crunch. “Somebody told them I could dance,” Parcels said with a bit of a laugh. Parcels admitted that he’d taken part in social dance years before that. Joking aside, Parcels said the scene went very well and he was told, “We loved your old man routine; you need to audition for a play.” When friends insisted, he auditioned for The Music Man, thinking he’d be in the chorus. Instead, he wound up with a speaking part. The slightly-older actor that’s still a bit new to acting said that it’s his “old-age substitute for team sports” and that his favorite part is the rehearsals and the camaraderie of the cast. Parcels takes his later-in-life career very seriously, even taking two years of tap dance and voice lessons when he first began acting to improve his skills. Rowe said she likes doing new shows, as well as oft-told stories. “What’s important to me is giving voices to art that hasn’t been told before. But it’s also great to bring different feelings to old stories, like Shakespeare or a re-telling of The Little Mermaid. Thackston, who is a student leader with Cru, a faith-based organization on campus, hopes to work upon graduation with “Jesus Film,” a film project that would take him to other countries to share the Gospel message from the book of Luke. From the experienced to the inexperienced; from the young to the not-so-young; from those who plan to make acting a career to those who are extracurricular-thespians – theatrical opportunities enchant and challenge, frustrate and thrill, delight and bring joy to those who take part.